Build up the kingdom of Evermore. 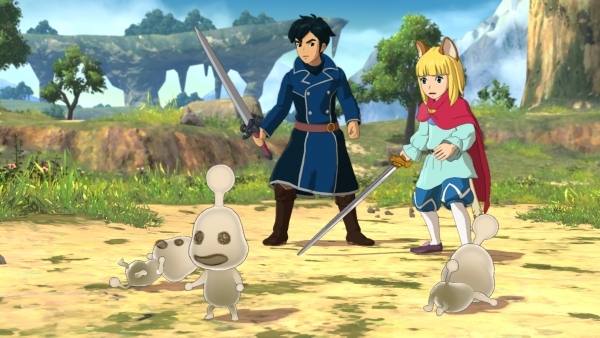 Bandai Namco has released a new set of Ni no Kuni II: Revenant Kingdom screenshots and artwork highlighting the various types of Higgledy partners players will encounter throughout the game, as well as Kingdom Mode. As you progress through the story, Evan will encounter spirits called Higgledies, who will aid Evan and his friends in battle by automatically attacking enemies, providing elemental or physical buffs to party members in battle, and opening shortcuts and new pathways in dungeons and throughout the world. There are 100 unique Higgledies in the game, including Higgledy heroes, each with their own unique attacks and special powers. Kingdom Mode gives Evan the opportunity to regain his throne by creating Evermore, a new kingdom where people can live in peace. Players will create and place a variety of buildings to set up the kingdom’s infrastructure and provide jobs to citizens. Additional storefronts will grant access to new items, weapons, and Higgledies. If you missed it late last week, read more about Kingdom mode, as well as the city of Broadleaf and other elements here.